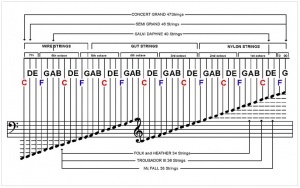 Every sting on your harp can be identified by its pitch (A-G) together with its octave (00-7). Octaves start at F (the black or blue stings) at the lower end and finish on E. Middle C is ‘4th octave C’. 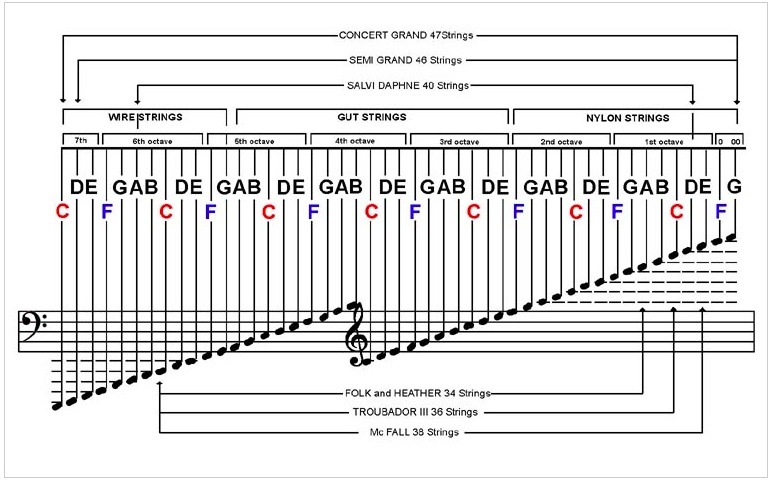 Concert grand harps, with 47 strings, start at 7th octave C in the bass and end on 00 octave G.
If your harp has less than 47 strings, use this string chart and mark in where your harp strings start and end. When you order new stings you need to be sure which octave and pitch the string is so that it is the right gauge and colour.